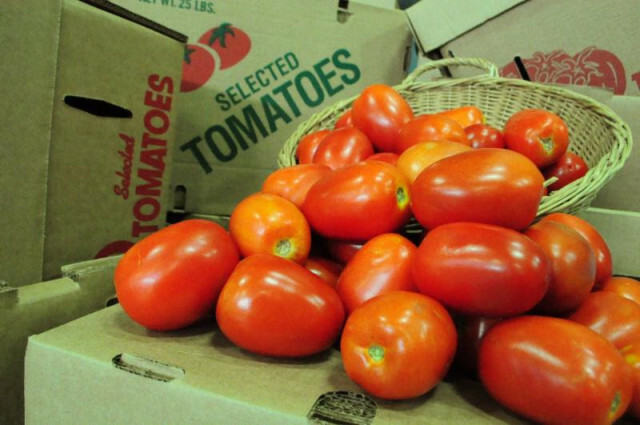 “Now we’ve run into a situation where our farmers have LOTS and LOTS of Certified Organic Red Roma Tomatoes, and we need your help to find them all good homes! Starting now, we are offering bulk orders of these lovely reds in 25lb. case quantities for only $27, so put your order in today! Orders can be placed now through the end of Thursday, July 31st. Whether you are a current CSA shareholder, a former CSA shareholder, or a friend of the Coop, you will all have the opportunity to choose from many of our current Spring Summer CSA pickup locations for where you would like to have your order delivered. Please take special note to the address of your pickup location as you place your order, for it will not be included in your confirmation email. Your tomatoes will arrive in brown tomato boxes with your confirmation receipt taped to the top and a label on the side of the box with your name. Please look carefully for your appropriate order, and do not hesitate to contact us if you have any questions while picking up your order. All deliveries will be sent out the week of August 4th, which is Week 12 of the CSA. Similarly to our last bulk orders, these deliveries will following our normal CSA delivery schedule. You must pick up at the location you choose, and it must happen between the provided pickup window at each unique location. Sorry, Folks, no exceptions here.